San Luis Obispo, Morro Bay, and Grover Beach city officials have amended their financial disclosure reports amid scrutiny over unreported donations from a marijuana business owner and a liaison for PG&E, according to a Cal Coast Times review of financial disclosure forms. 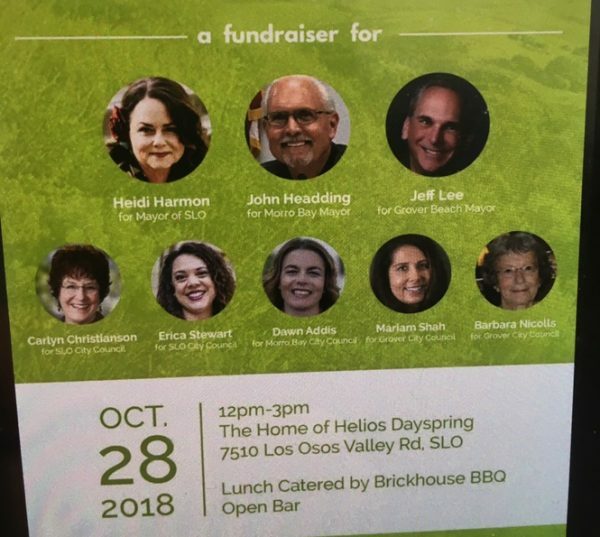 After Cal Coast Times reported that eight council candidates who benefited from an Oct. 28 fundraiser hosted by marijuana mogul Helios Dayspring had not disclosed the donation, Dayspring’s attorney James Wagstaffe threatened litigation if the article was not removed from the web. According to Wagstaffe, by reporting that the council members had not disclosed the non-monetary donation as required by the Political Reform Act, Cal Coast Times was insinuating that Dayspring bribed public officials for special consideration. However, the candidates were required to report the donation, not Dayspring, according to the Political Reform Act. The eight politicians include: SLO Mayor Heidi Harmon, Morro Bay Mayor John Headding, Grover Beach Mayor Jeff Lee, SLO Councilwoman Caryln Christianson, SLO Councilwoman Erica Stewart, Morro Bay Councilwoman Dawn Addis, and Grover Beach council members Barbara Nicolls and Mariam Shah. After Cal Coast Times reported on the fundraiser, Harmon, Heading, Chrisianson, Addis, Stewart, and Nicolls filed amended financial disclosure forms which report Dayspring’s non-monetary donations. Stewart said she had not realized she had to report the cost of the fundraiser on her financial disclosure Form 460. “I had been under the impression that the host’s in-kind donations of food and drink were under the hospitality category and when divided by the eight candidates was much less than $500 per candidate, so there was no need to report that on my 460,” Stewart said. During the weekend of the fundraiser, Harmon, Heading, Christianson, Stewart, Nichols, Lee, and Addis accepted multiple donations from people affiliated with the marijuana industry. Those donors, however, were generally listed as retired or affiliated with a non-marijuana related occupation. In several instances, descriptions of the donor’s occupation varied from candidate to candidate. On Sept. 30, 2018, Dawn Legg, a liaison for PG&E, spent $1,500 on a fundraiser she hosted for Harmon, Christianson, and Stewart. However, none of the candidates claimed the contribution on their financial disclosure forms. After Cal Coast Times questioned the failures to report Dayspring’s donation, all three candidates also claimed the Legg donation on amended financial disclosure forms they filed in March. Both Christianson and Stewart reported a $500 donation from Legg, and that they had returned $200 to Legg because the donation was above the city’s $300 donation limit. In contrast, Harmon reported Legg and her cohabitant Daniel Blandford had split the cost of the fundraiser. As such, Harmon did not refund any of the costs. California passed the Political Reform Act in 1974 to try to curb corruption by eliminating secret or anonymous contributions. Proponents of the act reasoned that if the public knew who donors were affiliated with they would be more informed voters. Candidates are required to disclose campaign receipts and expenditures on Form 460 including the date a donation was received, the donor’s identity, their occupations, and their address. Form 460 also is used to amend prior reports.